Dr. Verma has a special interest in pain management, rehabilitation, and the nutritional modulation of disease. As such, our Fear Free Certified Staff provides a wide array of mobile veterinary rehabilitation services in your home and at partner clinics: Dixboro Veterinary Dental Center in Ann Arbor, Michigan and Animal Health Clinic in Fenton, Michigan. Veterinary rehabilitation is similar to both the physical therapy and physical medicine and rehabilitation fields (PM&R) in human medicine. The mobile rehabilitation services Personalized Veterinary House Calls & Rehabilitation provides to dogs and cats include but are not limited to post-operative rehabilitation, pain recognition and management, stance analysis, therapeutic Class IV laser, customized exercise plans, brace/ wheelchair/ harness fitting, myofascial massage, weight management, neuromuscular electrostimulation, acupuncture, pulsed electromagnetic field therapy, nutrition/supplement counseling, and kinesiology taping. Please continue below to read more about various rehabilitation modalities. Conditions treated include osteoarthritis, cranial cruciate ligament injury, intervertebral disc disease, degenerative myelopathy, hip dysplasia, elbow dysplasia, biceps tenosynovitis, idiopathic facial nerve paralysis, and obesity. As with all of services, we provide direct doctor communication to our clients. To learn more about Dr. Verma's experience and qualifications in rehabilitation and nutrition, please click here. 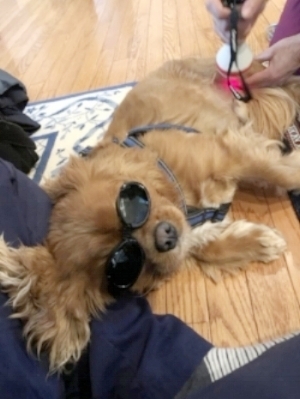 Dash enjoyed his in-home therapeutic laser session following his exercises. At the time of this picture, he was several weeks post MRIT operation. We are very proud of him and his family for continuing to meet the goals we set for him. Therapeutic exercises are a cornerstone of veterinary rehabilitation. They are useful for orthopedic, soft tissue, and neurological ailments. Much like human physical therapy exercises, they can improve muscle atrophy, proprioception, range of motion, and pain. The exercises can be performed with one of our technicians during a rehabilitation session and by you with your companion animal at home. We often can design a program that uses what you already have in your home without the need to purchase expensive equipment. Our stance analyzer helps detect weight bearing abnormalities that your animal may be experiencing. Dogs will typically bear 30% of body weight on each forelimb and 20% of each hind limb. Gaining an understanding of what percentage of body weight your animal is bearing on each limb helps us pinpoint areas of injury and pain in addition to areas of compensation. Stance analysis also helps us quantify your animal’s progress with his or her rehabilitation program. Alongside a thorough lameness exam that can help uncover gait abnormalities, this is a very useful tool! Also known as cold laser therapy and low level laser therapy, Class IV therapeutic laser utilizes light to increase cell metabolism and reduce inflammation and pain (photobiomodulation). On a microscopic level, the primary target is cytochrome c complex on the inner mitochondrial membrane. Common conditions treated in veterinary rehabilitation medicine include osteoarthritis, post-operative pain, tendonitis, muscle spasm, intervertebral disc disease, and degenerative myelopathy. Nutrition counseling is essential for every veterinary rehabilitation patient. Weight loss can often be the most beneficial treatment for many orthopedic and neurological patients. For those dogs and cats with severe muscle atrophy or who are under conditioned, a nutrition plan that involves appropriate weight gain can likewise be important. All nutrition plans developed by Dr. Verma considers every health condition that a patient may have. We offer both commercial diet assessment as well as homemade diet formulation to our patients. Acupuncture uses needles and sometimes electricity (percutaneous electrical nerve stimulation) to stimulate the nervous system at neurovascular intersections. Endorphins and other neurotransmitters are released, which causes a physiological response in our dog and cat patients. In addition to helping preserve nerve function in our patients with degenerative neurological disease, acupuncture can be useful for treating chronic pain. In veterinary rehabilitation, common conditions treated by acupuncture include osteoarthritis, degenerative myelopathy, intervertebral disc disease, muscle spasm, and idiopathic facial nerve paralysis. Virtually all of our rehabilitation modalities help control pain. However, some of our canine and feline rehabilitation patients require daily medications and/or supplements to function day to day as well as to perform therapeutic exercises. Dr. Verma is well versed in both pharmaceutical pain management protocols as well as pain relieving supplements. All recommendations he makes in this regard consider the patient’s overall health, including kidney and liver function. This unique tape can be applied to help control edema and swelling, reduce pain, increase range of motion, and improve muscle function. Myofascial massage can enhance recovery time, improve range of motion, and decrease pain. It increases vascular circulation, while simulating nerves. We regularly use myofascial massage in conjunction with our other modalities. Essential oils can be helpful with reducing anxiety before and during a rehabilitation visit. They may also help decrease inflammation and increase circulation. We often use them along with myofasical massage; a special blend is made for each patient.